To promote his book An Angel From Hell, author Ryan A. Conklin was a guest on the radio program “Dateline: Washington”, hosted by Greg Corombos. Greg asked Ryan about how Ryan knew right away after 9/11 that he wanted to join the Army. Ryan replied that he was what is known as a “9/11 baby”. He was one of the people that caused recruitment in the military to soar after the attacks. Ryan joined during his junior year in high school, when he was looking for what to do after he graduated. He wasn’t ready to go to college, so there was nothing pulling him away from joining. He wanted to go to Afghanistan to “put it to it to the guys who started this.” Furthermore, he didn’t want a cushy job. He wanted a front line job that would allow him to look the enemy in the eye. He decided the best fit for him would be in the infantry, and that’s what he got. Greg mentioned that in the book, Ryan tells about having several different kinds of jobs. Greg wanted to know if Ryan’s training helped him. Ryan answered that the two years of training he had before he deployed to Iraq helped, but there was a “lack of accurate training”. It was cold war style, training in the woods in green camo with green face paint, and learning how to attack a bunker. There were essential things for being in Iraq that weren’t taught, like speaking Arabic. 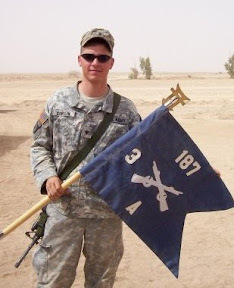 Once he got to Iraq, Ryan found himself learning as he went along on what he needed to know. Greg also asked about what urban fighting is like. Ryan said that it is about going out and being seen. It could be boring, but there were intense times with IEDs and sniper fire. Ryan explained that you always have to be ready and focused. It can be “zero to hell” in a second. On the psychological toll, Ryan said it depended on who you are with. It can actually be comical in a Humvee. He said you would think the soldiers would be wide-eyed, staring out the window waiting for something to happen. In fact there is a lot of joking around, while still doing their job. It’s a way to make the best of it. Cutting the tension keeps people’s sanity and keeps them from being too wound up. Ryan said if you don’t have a sense of humor, you are doomed. Greg asked Ryan Conklin what he hoped people would learn from the book. Ryan said that he wrote about what he saw and didn’t go above his area of knowledge. His style was to write like he was telling his story directly to an individual who knew nothing about what the service was like. From what he has been told by people who have read it, it makes the readers feel like they are out on patrol with Ryan, seeing what he saw. Author Ryan A. Conklin and his mother Pat Conklin were guests on the radio show “Radio Times” on station WHYY, discussing Ryan’s experience as a soldier in Iraq. Ryan Conklin was on the show to promote his book, An Angel From Hell. The host of the show, Marty Moss-Coane, spoke to Ryan about how some soldiers struggle when they come home from a deployment, trying to adjust back into civilian life. Ryan remarked how the Army didn’t take steps to ensure people integrated back into society. His experience was that he came back to the U.S. and right away got processed out and was quickly back at home with his parents. It happened so quickly, Ryan didn’t have time to adjust. It left him feeling like he was on his own, just drifting around. Not knowing what to do going forward, he looked back with a sense that he still had unfinished business with the military, that he was out of place being away from it. He didn’t have anything in his at-home life that filled the void of the detachment. He missed a lot of things he had become accustomed to, especially the camaraderie of his buddies. Ryan said that compounding that is that it isn’t possible to flip the switch to move from a combat mentality to a civilian one. In Iraq, the soldiers were constantly on guard in their minds with the anticipation of some attack, no matter what they were doing. When they come home, their mindset is still that way. It’s a struggle to deal with coming down from that apprehension. The host noted that in the MTV documentary about Ryan, Return to Duty, Ryan’s brother and sister remarked how vigilant Ryan was when he returned to his home town of Gettysburg. Ryan agreed, saying that seeing even a single piece of garbage on the highway would make his heart speed up, as his mind considered that it could be something that might blow up. Many other things would effect him adversely as well, such a loud noises from construction sites or traffic. Ryan’s parents were watching Ryan to see how he was adapting to normal life. His mom could see how he was struggling. She suggested that he do something constructive with a stack of old printed emails – emails that Ryan had sent from Iraq to his parents detailing his experience there. She told him it would be good for him to use them as a basis for opening up and expressing himself through writing. Marty asked Pat about the emails and Pat explained why she had kept them for giving to Ryan when he returned home. Ryan is considered the historian in the family. He is very much into family genealogy. As all the family are history buffs, she felt that the emails would be worth holding on to, not knowing when Ryan might want to refer back to them to revisit what had occurred. Ryan did use the emails, and with them wrote An Angel From Hell. Marty also asked Pat about an earlier experience when she had had to do something for Ryan: sign her permission for the then 17 year old Ryan to join the Army. Pat acknowledged that it was very hard for her to do. She was concerned for her son, but she could see that Ryan had thought through his plans well. He meticulously explained why he was doing it and how he would use it later in life. It took awhile to convince Pat, but reluctantly she acceded to her son’s intent. Marty asked Pat about the emotion she clearly felt at the airport watching Ryan say goodbye as he left to return to the Army, as seen in the documentary Return to Duty. Pat said it was very emotional for the whole family and hard on all of them. She felt it was probably hard for Ryan too, but he doesn’t say much to his parents about what happens after he is out of their sight. It was actually harder the second time that Ryan went into the Army because the family knew what had happened during the first deployment. As a parent feeling the responsibility to protect her child and knowing she couldn’t, she was distraught about seeing him go. Marty remarked that at the airport it was clear the family was trying to protect one another. Pat replied that the family didn’t want to put an additional burden on a departing soldier. They didn’t want him to to be concerned about how the family was bearing up. Once he was in Iraq they would again try to mask their concern, using humor when he called or wrote. They wanted to show Ryan that they were going to be okay. With the communication with Iraq. there was the difficult situation with the blackouts. Where there was an incident with casualties, the Army would put a blackout on the internet and phone connections, to control the release of information about it. Ryan had warned his parents about it. He told them that if they didn’t hear anything for several days, that’s good. The Army would notify the family within 48 hours if their loved one had been injured, so if 48 hours had passed, they would know they were okay. The time during the 48 hour wait periods was very slow. Pat would want to communicate with Ryan, to know how he was doing, how he was feeling, what he was eating, and other parental concerns. Something that Pat and her husband never needed to say to Ryan was their views on the war. Ryan still doesn’t know what his parents’ view is. What he does know is their faithful support of the soldiers in Iraq and how proud his parents are of him and what he has accomplished during the years of his young life. On April 7th, 2010, Ryan A. Conklin was a guest on The Marc Steiner Show, a radio show broadcast from Baltimore, Maryland. Ryan Conklin went on the show to discuss his memoir, An Angel From Hell. The host Marc Steiner was well versed in the details of the book and spoke with Ryan about several of the important parts in it. Steiner asked about 9/11, which Ryan refers to at the start of the book. Ryan replied that he was in high school, planning on going to college, but not sure exactly what his plans would be after that. After 9/11, he was sure of what he wanted to do. He wanted to join the army. He joined at age 17 but waited until he graduated before going into uniform. Steiner wondered if Ryan has considered why he joined the Army while other students did not. Ryan replied that it was something he wanted to do but it wasn’t something that many others did. He didn’t join because of following anyone else. Next Steiner talked about Ryan entering Army training. Ryan explained that he had chosen to be an infantryman, but it was the Army that placed him with the 101st Airborne. Ryan was happy that to be part of it because of their traditions, such as their phrase, “rendezvous with destiny”. For him the airborne part was learning to jump out of helicopters instead of planes. He trained non-stop for 2 years before deploying. That amount of time was good for building camaraderie and giving him the training he needed to be effective in Iraq. Steiner noted that the book is not a reflective work; it’s about what Ryan went through everyday. Ryan agreed that it is not an analysis, but rather a narrative about what daily life was like. He said he wrote it as if telling the story to a person who is ignorant of everything connected with the military. There are a lot of acronyms connected with the Army, but where Ryan used them, he provided definitions. A major incident in the book is the death of Andrew Kemple and Steiner asked about it. Ryan stated that the war wasn’t personal for him until Kemple’s death. There had been injuries to friends that had caused some emotion, but Kemple’s death by a sniper hit Ryan with the reality of what could happen to any of the men in his platoon. There was a certain sense of comfort and familiarity of knowing what to do to protect yourself, but after the death of Kemple, Ryan started being more cautious and attuned to all the hidden dangers. Since there is no front line and no enemy in uniform, anyone could be the enemy. It was hard to deal with. A few days after Kemple’s death several Iraqis were taken prisoner in relation to the sniping. As one of their guards, Ryan took his anger out on them, yelling and ranting and getting things off his chest. It felt good at the time, but while writing about it, Ryan felt that he had deviated from his usual good ways. Steiner asked Ryan if he would still enlist if he had it to do over again. Ryan answered that yes, knowing what he knows now, he would. The friendships and life lessons from his time in the Army are invaluable. One of the important lessons he learned was how much greater his personal limits are than what he might have thought otherwise. The circumstances he was in, where he was pushed and where he was encouraged by seeing the endurance of his buddies, caused him to go beyond the mental barrier of his perceived limitations. He is still able to apply that expanded view of his ability in his everyday life. However, now that he has done two deployments, Ryan has no interest in returning to the military. 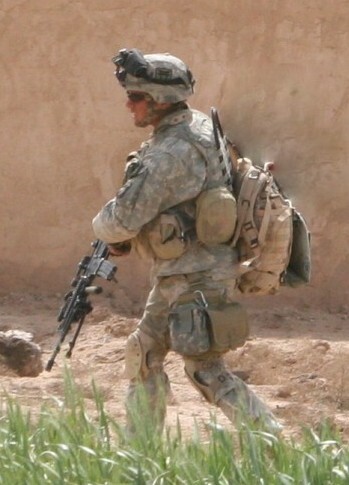 After the first deployment, he missed the camaraderie of his buddies and the good feeling from doing a job (as an infantryman) that he knew he was very good at. After the second tour, he had it out of his system to be an infantryman again. Technically, Ryan is still in the IRR, but the timing requirements of being recalled another time make it unrealistic for it to happen again. On a question about the Iraq and Afghanistan Veterans of America (IAVA), Ryan talked about his involvement with the group, including his participation in their “Storm The Hill 2010” campaign to lobby Congress for veterans’ issues. Ryan spoke with Congressman and Senators and staff of the President about the IAVA’s agenda. A radio listener called in with a question, asking Ryan if he had considered joining Iraq Veterans Against the War (IVAW). Ryan replied that he had been to some of their events so that he could better understand their position, but their view is not necessarily what he consistently believes. His focus is primarily on the cause of supporting returning veterans. At the end of the program, Steiner asked Ryan about one of the most striking passages in the book, which is a description of the visible aftermath of a suicide bombing. The words go into graphic detail of what a field of body parts looks like. Ryan explained that he wanted to adequately capture the horror of it. Referring back to the impetus for the whole book, he said he wrote the chapter as a way to get the images out of his head. For him this exercise was very effective, and he encourages other veterans also to use writing as therapy. With the advent of Ryan Conklin’s book being available for pre-order on various book seller sites, Ryan wrote a plug for his book in a blog post on his MySpace page. He provided information about what the book contained, why he wrote it, and what he hoped readers would get out of it. 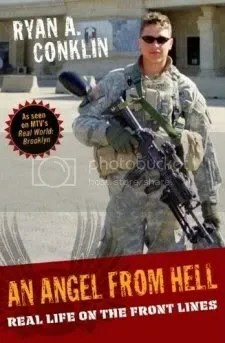 As reported here before, the title “An Angel From Hell” refers to Ryan being in Company A of the 3/187th Infantry Regiment (Rakkasans). That company was known as the “angels From Hell”, so being a soldier in that company made Ryan one. The scope of this personal memoir is the year that Ryan spent in Iraq during his first deployment there (2005-2006). While there, his company provided security for Saddam Hussein’s trial in Baghdad, then moved north to Tikrit, where they did combat missions in the Al Saladin Province. Ryan mentioned the various kinds of jobs he performed at that time, including rifleman, turret gunner, radio telephone operator, assistant gunner, and general morale booster. The book came about because of the lack of any other means to resolve the deeply buried emotions that Ryan felt about his experiences in combat. He started writing about them and found the process to be a form of self-therapy. It was a way for him to let his guard down and be open about what he felt. He could draw his emotions from his mind, put them on paper, and then push them away. Ryan included all the little things he did during both the good times and bad times. He put in things he was proud of and things he wasn’t so proud of. It took him a year, but eventually he ended up with 400 pages of his perspective of being a soldier in Iraq. Interestingly, the book at first was intended to be for Ryan’s eyes only. Then at some point, he realized that other people might be interested in what he had to say as well. Now, he views his book as being meaningful for any reader. He hopes it will provide insight to all on what the men and women in the military do in Iraq and what kind of situations they face there. An Angel From Hell – BUY THE BOOK! !